I am not a fan of February. It’s a dreary month, looking out the window to month old snow, flurries won’t quit and freezing temperatures make me want to relocate to a tropical locale. Instead, I find my self making pot after pot of vegetable soup and hoping for an early spring. Last February I was 9 months big and pregnant, there was record snow fall, my 87-year-old neighbor kept me company and I watched the entire winter olympics. Needless to say, I didn’t leave the house much so I would wait for my husband to come home and beg him to go Cracker Barrel. In the twenty times we went, I ordered the same thing every time - bowl of veggie soup and a big side of those sourdough croutons that are covered in butter. I know for sure that my Cracker Barrel dinner did not ring in under 300 calories but my version does even with a biscuit! Heat oil over medium-high in a large stock or soup pot. Add onion, meat, salt and pepper. Brown meat quickly then add broth and water bringing to a boil. Reduce to a simmer and cook for 45 minutes to 1 hour. Add carrots, potatoes and crushed tomatoes to pot and continue simmering for 30 more minutes. 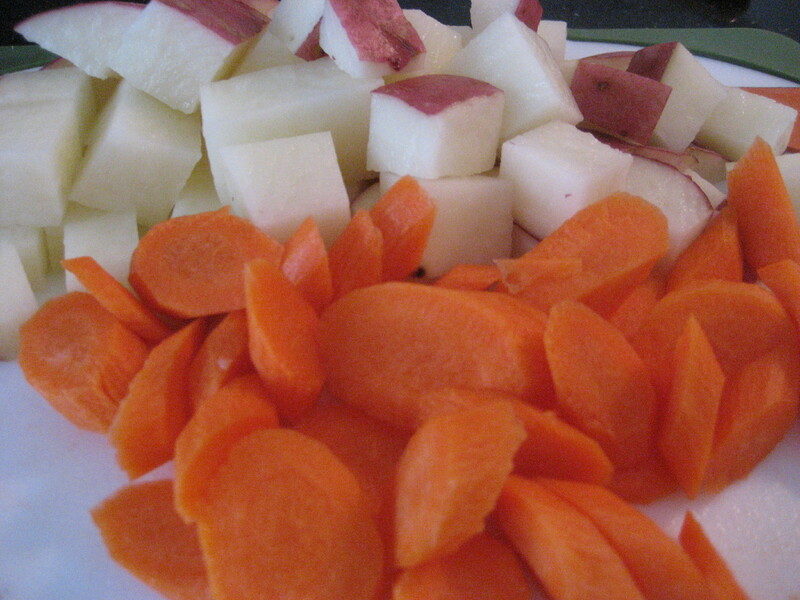 Meat should be getting more tender and potatoes and carrots will be softening. Add the rest of the vegetables, bay leaf and season again with salt and pepper. Simmer at least another hour before serving. If more liquid is needed just add water. 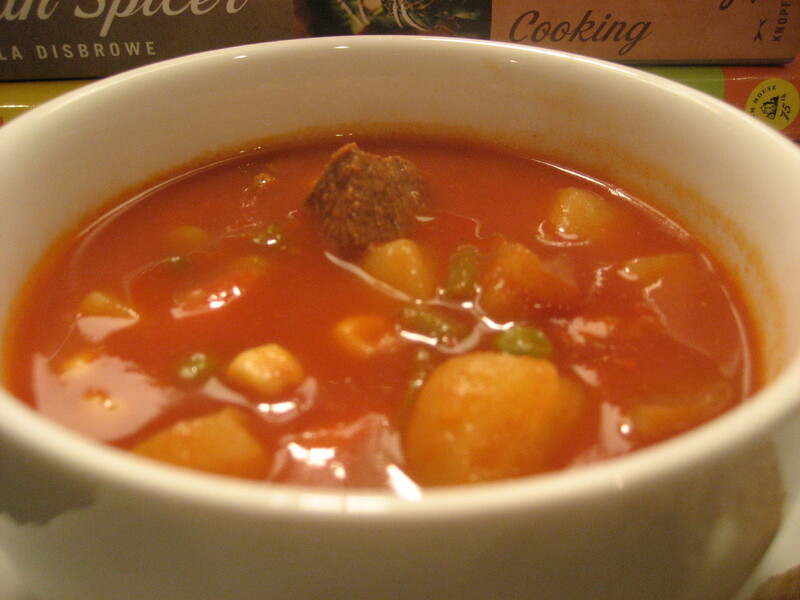 The longer the soup cooks the better it will taste. Take out the bay leaf before serving. 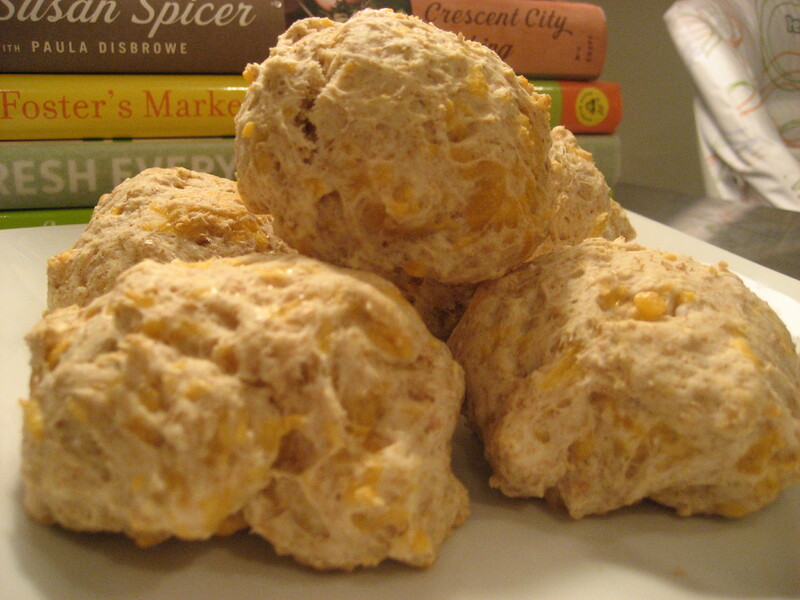 Combine all dry ingredients in a mixing bowl and set aside. Melt butter in a small bowl. Combine beer and sugar then add to flour mixture, then add butter and combine. Add cheese and stir well. This will make a sticky dough. Just drop spoonfuls on an ungreased cookie sheet. Bake for 10-12 minutes. 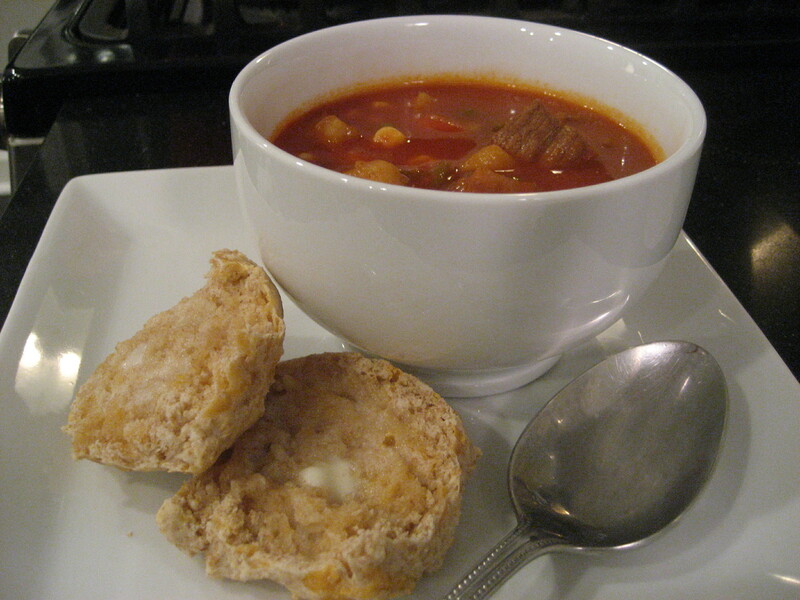 Using My Food Diary’s recipe builder, the soup is about 100 calories for a one cup serving and each biscuit is around 100 calories with 3 grams of fat. One of my favorite places to shop is The Fresh Market, if you have one nearby go take a look. 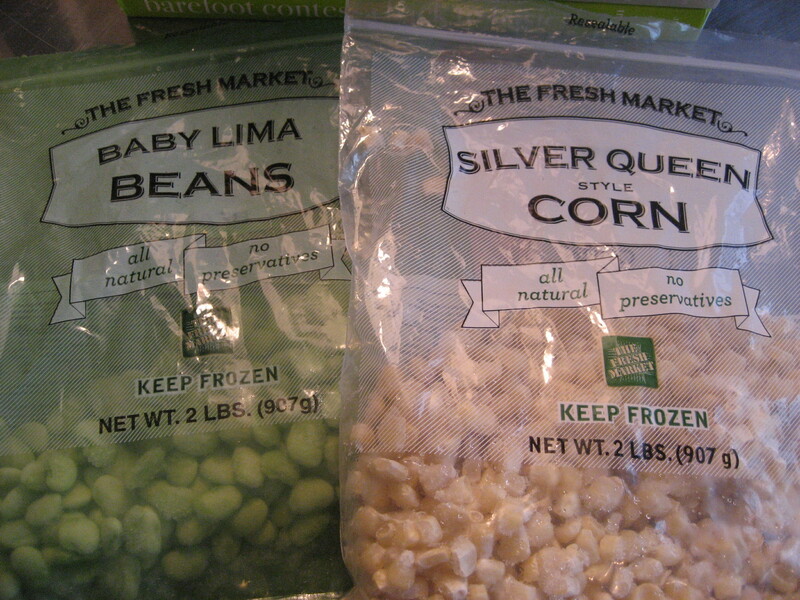 They have these fabulous frozen vegetables including Silver Queen Corn! Yep, Silver Queen Corn frozen and there all year round. 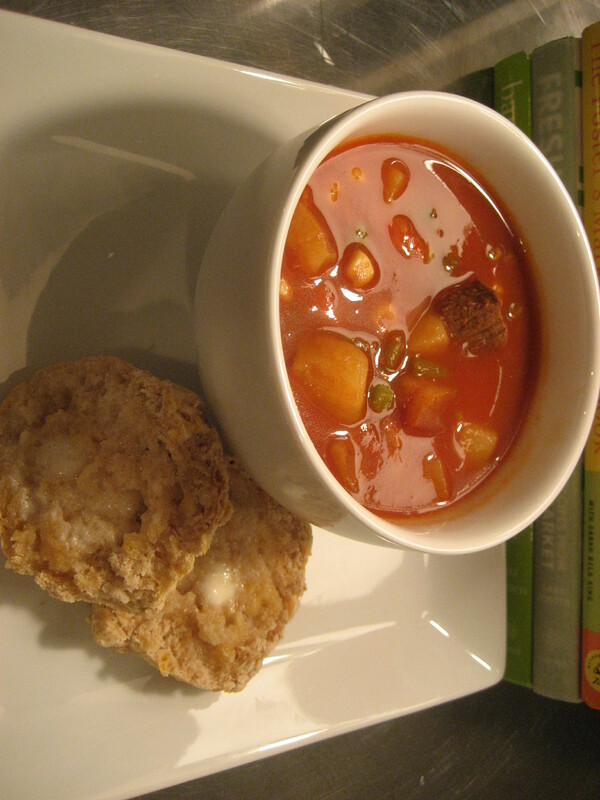 This entry was posted in Soups and tagged baking, beer, biscuits, breads, cheddar beer biscuits, cooking, Cracker Barrel, February, Food, My food diary, recipes, silver queen corn, soups, The Fresh Market, vegetable beef soup on February 9, 2011 by lolleigh.